My latest gig as a freelance journalist is an exciting opportunity to work on a new, Charlotte-based television show called 282 (represents the first three digits of the city's zip code, by the way). This new venture is derived from a partnership between CLT Blog and WTVI (Charlotte's PBS affiliate), and it's a weekly, roundtable news show where media personalities will discuss hot topics prevalent in the Charlotte area. Former Creative Loafing Charlotte editor-in-chief Carlton Hargro is the host of the half-hour show, and my role is Andy Rooney-esque (but not so angry) in that I'll be contributing a three-minute-or-so editorial segment each episode about a current topic I happen to feel strongly about or that I think you will be interested in. 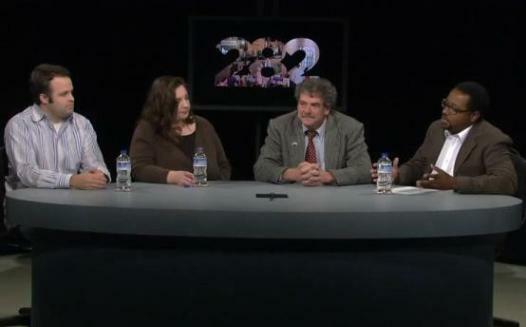 We taped the pilot, or first, episode of 282 at noon today at WTVI's studios, and it's now posted online. The show is in beta right now (so please pardon the flubs), and the first few episodes will run online only. After we've gotten some practice and worked out the kinks, 282 will begin airing weekly on WTVI on Mondays at 6:30 p.m., starting January 30, 2012 (WTVI is channel 42 on digital television a.k.a. regular TV, DirecTV, Dish Network, and AT&T U-verse; channel 5 on Time Warner Cable). And because it's important that the show has a strong web and social media presence (Twitter @282tv), beginning next Monday, December 12, we’ll be live-streaming the show online each Monday at noon at cltblog.com/live. So you'll watch it as we tape it. Click here to learn more about 282 and the pilot episode, and expect to see the show grow, evolve, and get better over the next two months (an improved set—we hope—enhanced graphics, presentation, its own website, etc. ; but the one thing that's already great is the opening theme music—love it). There are some talented people involved with 282 so I think it has the potential to be something you'll look forward to watching each week.